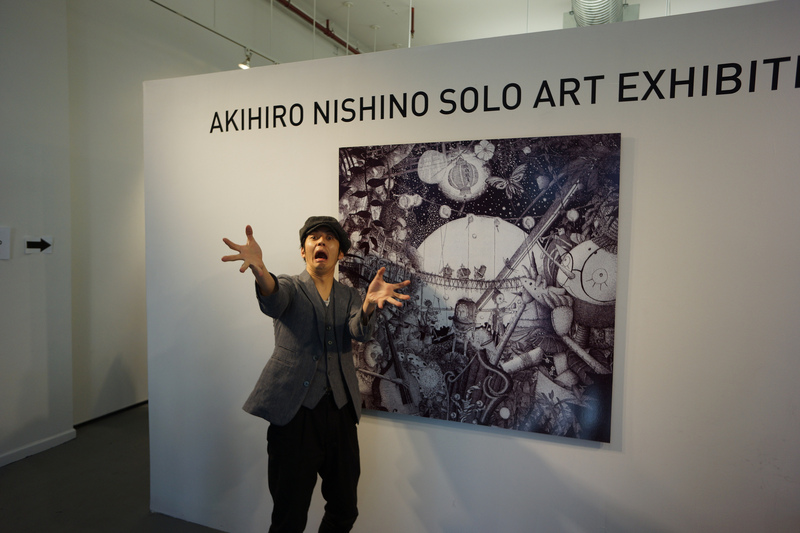 In February of 2013 Akihiro Nishino, a Japanese comedian and children’s book author/illustrator, held his first solo exhibition in New York. To have the sketches of his books displayed at One Art Space in Tribeca, Nishino raised more than $40,000 through a crowdfunding campaign. Fast-forward five years, and Nishino is back for his second solo exhibition, celebrating his most recent book, Poupelle of Chimney Town, a densely illustrated work that is a bestseller in Japan, topping 350 thousand copies sold thus far. This time around Nishino opted to hold the exhibition at NYC Event Spaces in Midtown rather than in a traditional gallery. To show his art in non-traditional spaces, Nishino needed to find the best lighting. So he added a vivid pop of color and technology, creating LED panels of the book’s 41 pictures, illuminating them from within to bring Chimney Town to life. 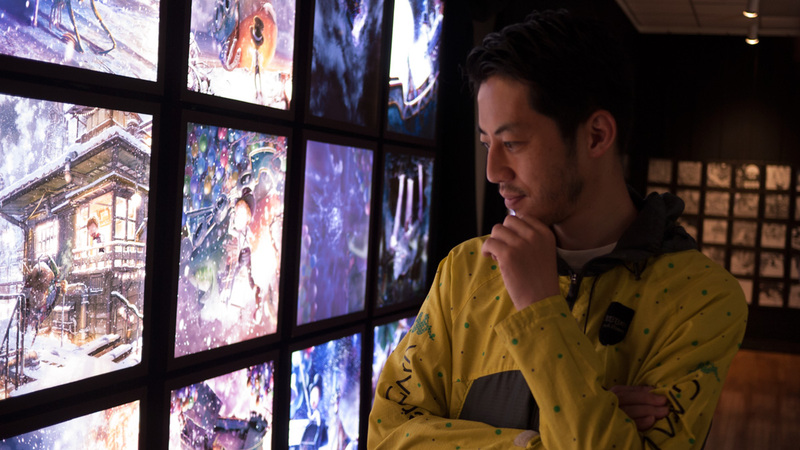 Nishino has displayed his LED panels in a forest, on a dark market street after hours, in cafes, and at shrines. The panels are waterproof, giving Nishino the flexibility to take his art anywhere. His illustrations are filled with stunning details that reveal the magical world within the artist’s imagination. “Most of my inspirations come to me when I’m going out because I’m not a person who watches TV or surfs the internet or writes on a computer all the time. So when I go out I find something interesting,” Nishino says. 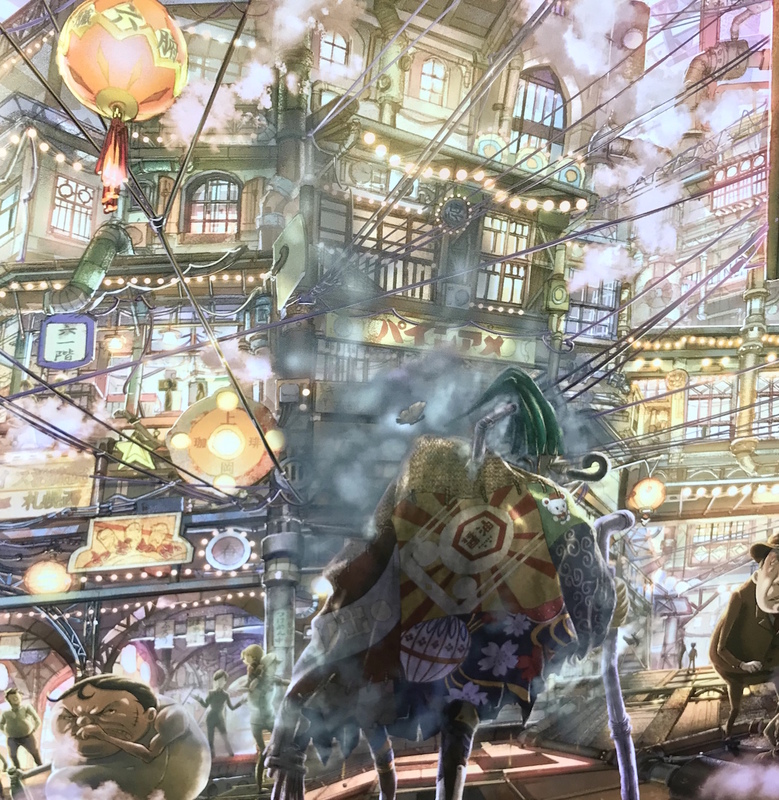 Some of those interesting things include the crowded, hot streets of Taiwan; and the gangsters and the homeless in front of the Painame candy store in Osaka’s old neighborhood of Shinsekai. He values the experiences of seeing these cityscapes in person, and through those experiences he created the new world of Chimney Town, a town that is surrounded by four thousand meter-high cliffs and filled with chimneys, which shroud the air with black smoke that blocks the sky. The residents of the town are unaware of the existence of stars, but a man made of garbage and a young chimney sweep go on an incredible journey beyond the smoke. 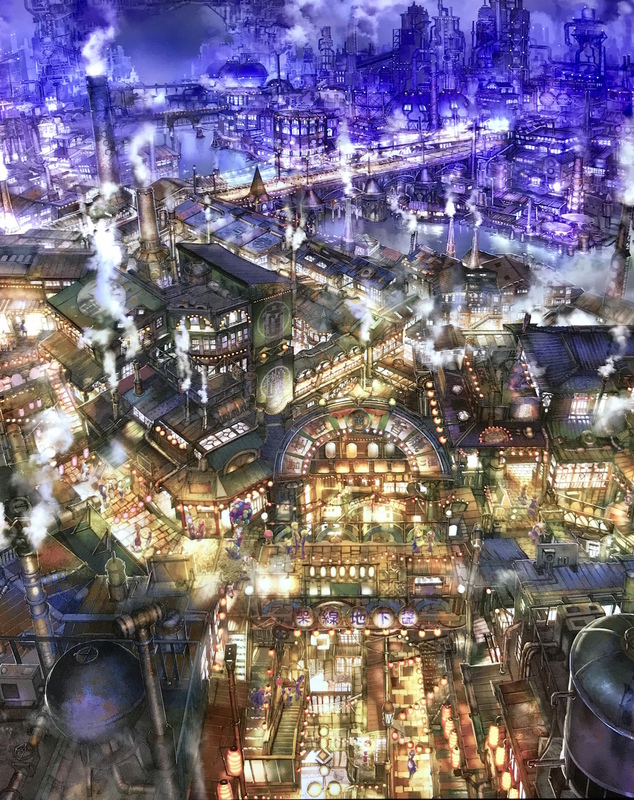 In the production of Poupelle of Chimney Town, Nishino collaborated with a team of 40 artists, illustrators, 3D modelers, and designers for the first time. They formulated a strategy for each page of the book, not only about the details of the town but the characters as well. The height, clothing, and even what the characters eat were planned to ensure consistency. It took five years to finish the book, with the help of two crowdfunding campaigns that raised around $500 thousand in donations from more than 9,550 people. Production is underway to turn Poupelle of Chimney Town into a movie with the expected release to be in 2020, but Nishino has plans for it being much more than a simple film. He is building a full model of Chimney Town in Japan, where you can see the world of the book through a tablet. For example, when visitors hold the tablet up to a bridge, the tablet will reveal the image of the bridge as it exists in Nishino’s book. In three years, Nishino says visitors will wear Augmented Reality glasses to tour the imaginary city. Visitors will see a hint of this technology at the exhibition through Nishino’s collaboration with Augmented Realty unit AR3Bros. 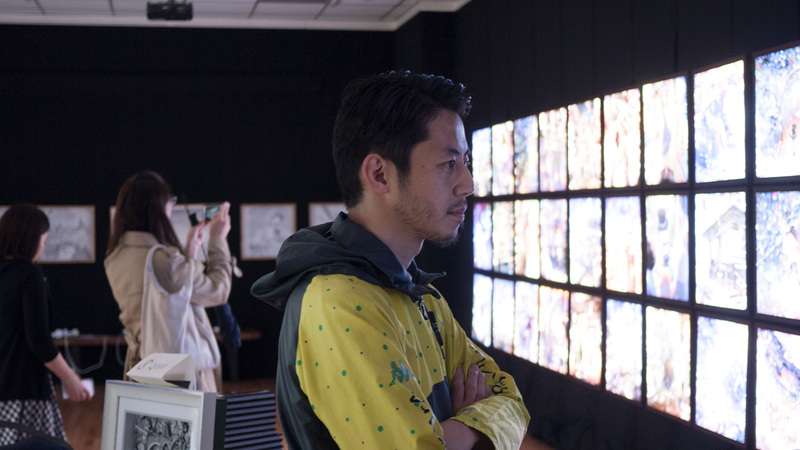 Using tablets, visitors can watch a 3D Nishino explain how he produces the artworks and watch the process from black-and-white sketch to full-color illustration simply by pointing the tablet in the direction of a sketch on the wall. His current exhibition is a great leap creatively from 2009, when he published his first book, Dr. Ink and Starry Sky Cinema, using only a 0.03mm sketching pen. 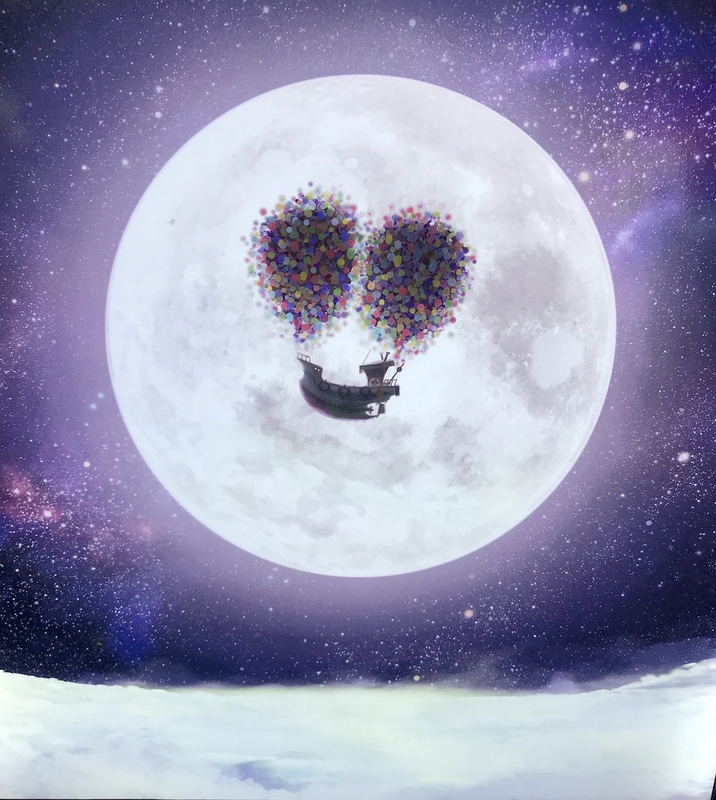 Prior to Chimney Town, he also wrote and illustrated Zip & Candy – Christmas of Robots and Music Box Planet. He’s not just a children’s author, either: His business book, Fanfare of a Revolution – Modern Day Money and Advertising, is also a bestseller in Japan. Nishino continues to write stage plays and comedy show sketches in addition to penning children’s picture books. For Nishino, there is no separation between being a well known comedian and TV personality and being an author. His secret to success is in the time he devotes to turning his dreams into reality. Part of taking action is to move Japan outside of its limitations with regard to filmmaking and entertainment. Nishino thinks the picture book is the key to changing the rules of the entertainment industry in Japan. 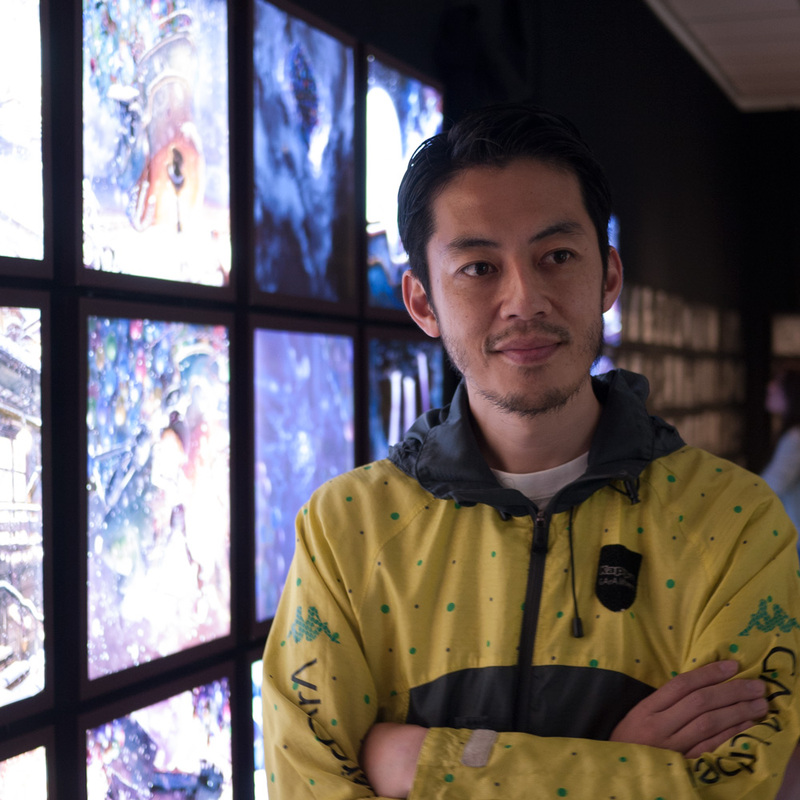 By using technology to enhance his books and bring them to life, Nishino is proving to be a changemaker in his own right, but he knows he won’t achieve this on his own. – 4 W. 43rd Street (between 5th and 6th Avenues).